About half of the time someone is born totally deaf, it’s because of their genetic makeup. Those people are typically treated with cochlear implants, but now researchers from Europe and the U.S. are looking at gene-based treatments as well. Deaf mice treated with a new kind of gene therapy developed the ability to hear almost as well as healthy mice, according to research published Tuesday in the journal PNAS — findings that suggest gene therapies may someday help with previously-untreatable conditions. The mice had what’s called DFNB9 deafness, the type that accounts for between two and eight percent of gene-related cases of human deafness. In DFNB9 deafness, a protein called otoferlin can’t perform its usual role of transmitting sound information gathered by the fine hairs in the inner ear. 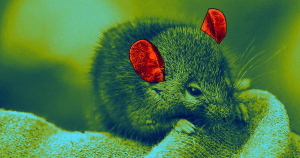 But after altering the deaf mice’s genomes with specially-crafted viruses, the mice were able to hear almost as well as mice that were born with functioning otoferlin. Even after altering the same specific gene in mice as what causes DFNB9 deafness in humans, it’s too soon to say that these gene-editing viruses can be used to treat people. There’s a long road between animal experiments and human clinics. There’s more reason to be wary of this treatment. According to a conflict of interest statement in the PNAS article, one researcher from the University of Florida stands to profit if this virus-based technology takes off — so it’s worth waiting to see if the work holds up in further studies. The post Scientists Used Gene Therapy to Cure Deafness in Mice appeared first on Futurism.